Objective: To study maternal and neonatal outcome in postdated pregnancies. Study Design: Prospective observational study. Results: Of 100 cases 79(79%) cases were under 20 to 25 years, majority cases were primigravida (62%), overall caesarean rate was 34%, Meconium stained liquor with fetal distress was the most common indication for LSCS 8(23.5 %) , fetal distress was the most common fetal complications, rate of NICU admission was 33.33% at 41 weeks 1 day to 42 weeks, rate of induced labour is 71.43% at 41 weeks 1 day to 42 weeks. Conclusion: In our study we concluded that prolonged pregnancy was associated with significant risk of perinatal complications like fetal distress, meconium aspiration syndrome and IUGR. There was significantly increased risk of obstetric complications like oligohydramnios, perineal tear, atonic pph and shoulder dystocia. Postdate, postterm, postmaturity, and prolonged pregnancy is accepted terms by WHO and the International Federation of Gynecology and Obstetrics to describe pregnancy beyond dates (expected date of delivery). As per WHO, postterm pregnancy (PTP) is defined as a pregnancy that persists beyond 294 days or 42 weeks of gestation. The reported frequency of PTP is approximately 7%. The incidence of PTP varies depending on whether the calculation is based on the history and clinical examination alone, or whether early pregnancy ultrasound examination is used to estimate gestational age., The assessment of the gestational age by early ultrasound examination has reduced the “incidence” of PTP by 50.0%. The most cases of PTP result from a prolongation of gestation. Other cases result from an inability to accurately define estimated date of deliver. Complications to both mother and fetus are seen in postdated pregnancies. It has been reported that in a pregnancy which has crossed the expected date of delivery; there is an increased risk of oligohydramnios, meconium stained amniotic fluid, macrosomia, fetal postmaturity syndrome, and cesarean delivery, all of which jeopardize the baby as well as the mother. Prolonged pregnancy has always been regarded as a high-risk condition because perinatal morbidity and mortality is known to rise. The interest in postdatism (just beyond expected date of delivery) has been recent and the management is controversial, more so with the advent of sonography providing information about placental aging and amount of amniotic fluid.,, The aim of the present retrospective study was to analyze the outcome of pregnancies which crossed the expected date of delivery. Placental sulfatase deficiency (an X-linked recessive disorder) which results in reduced placental estrogen synthesis. This leads to poor expression of oxytocin and prostaglandins receptors in myometrium. The amniotic fluid volume reaches its peak at around 38 weeks which there is a gentle decline by approximately 125 ml/week. An average volume of 800 ml at 40 weeks and this can be picked up sonography. Placenta starts showing infarcts and calcifications as the pregnancy goes into 38 weeks. Most of the obstetricians prefer termination of pregnancy before 42 weeks as the risk of fetal mortality is doubled in pregnancies which have crossed 42 weeks than the pregnancies at 40 weeks. The purpose of our study is to find out mode of delivery, maternal and neonatal outcome in pregnancy beyond 40 weeks. 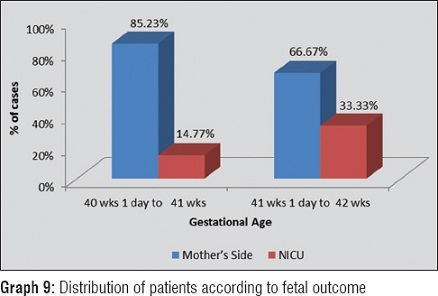 This study includes both primigravida and multigravida beyond 40 weeks of gestation admitted from September 2014 to August 2015 in Obstetrics and Gynaecology Department Jawaharlal Nehru Medical College, Sawangi (Meghe), Wardha, Maharashtra. The study design was prospective observational study. The study was conducted by Department of Obstetrics and Gynaecology, Jawaharlal Nehru Medical College, Sawangi (Meghe), Wardha, Maharashtra. Duration of the study was two years from September 2014 to August 2015. The sample size was one hundred. Sampling technique was nonrandom sampling (purposive) method. Maternal morbidity as atonic pph, 3rd degree and 4th degree perineal tear. Maximum 79% cases were of age group 20–25 years, 19% cases were of age group 26–30 years, and only 2% cases were of age group 31–35 years mean ± standard deviation 23.56 ± 2.75 (20–35 years) [Table 1]. 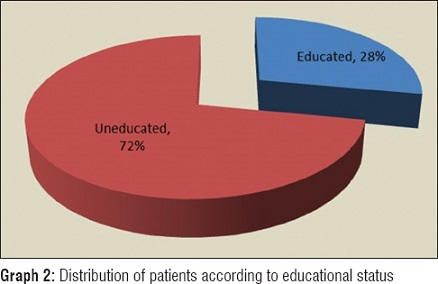 Seventy-two percent patients were uneducated and 28% were educated [Table 2]. 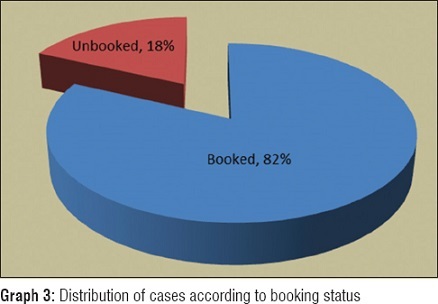 Eighty-two percent booked cases and 18% unbooked cases [Table 3]. 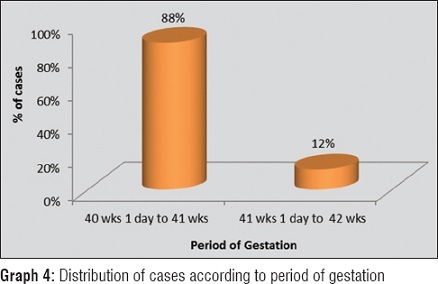 Maximum, i.e., 88% cases were of gestational age between 40 weeks 1 day and 41 weeks and 12% cases were of gestational age between 41 weeks 1 day and 42 weeks [Table 4]. 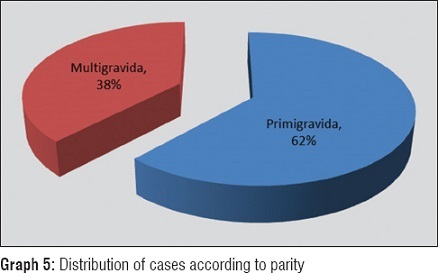 Maximum cases were primigravida [Table 5]. A total number of FTNDs were 64, out of which 57 cases were of gestational age 40 weeks 1 day to 41 weeks and 7 cases were of gestational age 41 weeks 1 day to 42 weeks. A total number of cesarean sections were 34, out of which 29 cases were of gestational age 40 weeks 1 day to 41 weeks and 5 cases were of gestational age 41 weeks 1 day to 42 weeks. 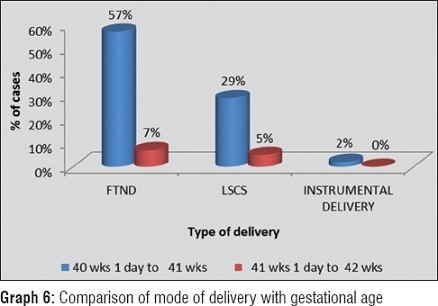 A total number of instrumental deliveries were only 2, of gestational age 40 weeks 1 day to 41 weeks [Table 6]. By using Chi-square test statistically found correlation between gestational age and type of delivery [Table 7]. A total number of cesarean sections were 34. Maximum number of cases, i.e., 23.53% indications were meconium stained liquor with fetal distress, in 20,59% cases indications were failure of induction, in 20.59% inducations were nonreactive NST, in 17.61% cases indications were CPD, in 14.71% cases indications were nonprogress of labor, and in 2.94% cases indications were cervical dystocia [Table 8]. By using Chi-square test statistically found correlation between gestational age and NICU admission [Table 9]. Oligohydramnios found in 17% cases, perineal tear in 4% cases, atonic pph in 3% cases, and shoulder dystocia in 5% cases [Table 10]. Fetal distress found in 9% cases, meconium aspiration syndrome in 7%, and intra uterine growth restriction (IUGR) in 1% cases [Table 11]. This study includes both primigravida and multigravida beyond 40 weeks of gestation admitted from September 2014 to August 2015 in Department of Obstetrics and Gynaecology, Jawaharlal Nehru Medical College, Sawangi (Meghe), Wardha, Maharashtra. 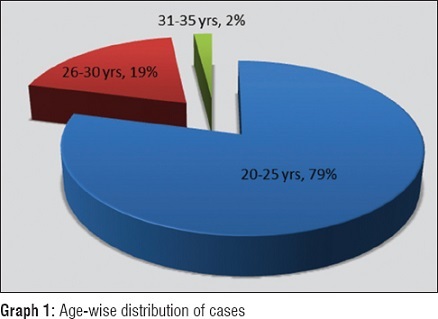 In our study, out of 100 cases, 79 (79%) cases were under 20–25 years, 19 (19%) cases were under 26–30 years, and 2 (2%) cases were under 31–35 years. While the mean age was 23.56 + 2.75 (20–35 years). While the mean age in Mahapatro's  study was 24.19 ± 3.30, while the mean age in Eden et al. 's  study was 25.8 years. In our study, majority cases were primigravida (62%) which is similar to Mahapatro  and Alexander et al. 's study. In our study, out of 100 cases, 64 cases were full-term vaginal delivery, whereas 34 cases were of LSCS and 2 cases were of instrumental delivery. 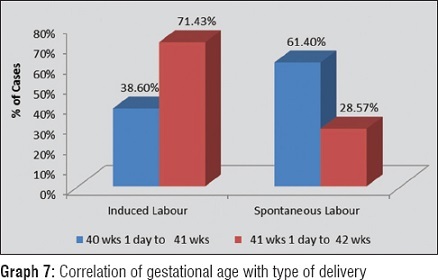 It was observed that out of 64 vaginal delivery 57 patients delivered between 40.1 weeks and 41 weeks of gestational age, out of 57 cases 35 (61.4%) progressed and delivered spontaneously, and 22 cases (38.6%) delivered after induction of labor. Out of 64 vaginal deliveries 7 cases were between 41 weeks 1 day and 42 weeks out of which 2 cases (28.57%) progressed and delivered spontaneously and 5 (71.43%) case were delivered after induction of labor, P value was significant <0.0001. In our study, overall cesarean rate was 34% in Singhal et al. 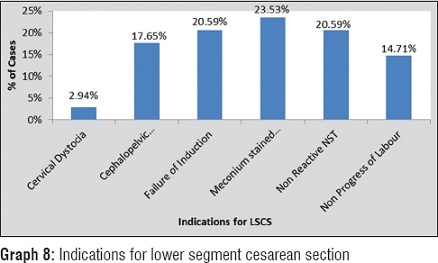 Rate of LSCS was 16.7% and in the study by Mahapatro. It was found to be 28.9% out of 34 pregnancies the rate of LSCS beyond 41 weeks was found to be 5 (14.7%) which was (21.1%) by Kaplan et al. 's study. The rate of instrumental delivery in our study was 2%, whereas in Mahapatro's  study, it was found to be 5.72%. In Singhal et al. 's  study and Davinder et al. 's  study, the rate of instrumental delivery was 8.6% and 10.35%, respectively. 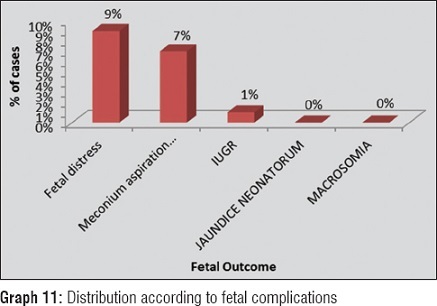 In our study, fetal distress was the most common fetal complications, i.e., 9%, meconium aspiration syndrome found in 7% cases and IUGR in only 1% cases, which is similar to Vndana Nmbargi et al. 's study [Graph 1],[Graph 2],[Graph 3],[Graph 4],[Graph 5],[Graph 6],[Graph 7],[Graph 8],[Graph 9],[Graph 10],[Graph 11]. Prolonged delivery was associated with increased risks of perinatal complications such as fetal distress and meconium aspiration syndrome. The rate of cesarean section was higher in prolonged pregnancies. The timely onset of labor and birth is an important determinant of perinatal outcome. Most pregnancies undergoing postterm induction are not postterm when assessed by ultrasound dates. Regardless of whether prolonged pregnancy is considered to be a risk factor requiring intervention, the proportion of pregnancies considered “postterm” can be reduced considerably by a dating policy which ignores menstrual dates and establishes the expected delivery date on the basis of ultrasound dates alone. Management of postdated pregnancy is a challenge to obstetrician and a careful advice and monitoring can alleviate maternal anxiety and untoward complications. Pregnancy beyond 40 weeks needs frequent amniotic fluid index monitoring as in our study we found more cases of oligohydramnios. In our study, we observed pregnancy beyond 41 weeks increases rate of cesarean section and NICU admission. In our study, we concluded that prolonged pregnancy was associated with significant risk of perinatal complications such as fetal distress, meconium aspiration syndrome, and IUGR. There was significantly increased the risk of obstetric complications such as oligohydramnios, perineal tear, atonic pph, and shoulder dystocia. The adverse outcome can be reduced by making accurate gestational age and diagnosis of postterm gestation as well as recognization and management of risk factors. Considering the maternal and neonatal morbidity associated with prolonged pregnancy, pregnancy should not be allowed to go postterm. The patient should be counseled about risk of increasing gestational age. These women should be offered induction of labor before 42 weeks of gestation to avoid adverse neonatal consequences. Balakrishnan S. Textbook of Obstetrics. Hydrabad, India: Paras Medical Publishers; 2013. p. 218. Neff MJ. ACOG Releases Guidelines on Management of Post-term Pregnancy. Am Fam Physician 2004;70:2221-5. Eik-Nes SH, Okland O, Aure JC, Ulstein M. Ultrasound screening in pregnancy: A randomised controlled trial. Lancet 1984;1:1347. Ingemarsson I, Hedén L. Cervical score and onset of spontaneous labor in prolonged pregnancy dated by second-trimester ultrasonic scan. Obstet Gynecol 1989;74:102-5. Marahatta R, Tuladhar H, Sharma S. Comparative study of post term and term pregnancy in Nepal Medical College Teaching Hospital (NMCTH). Nepal Med Coll J 2009;11:57-60. Grant JM. Induction of labour confers benefits in prolonged pregnancy. Br J Obstet Gynaecol 1994;101:99-102. Alfirevic Z, Walkinshaw SA. A randomised controlled trial of simple compared with complex antenatal fetal monitoring after 42 weeks of gestation. Br J Obstet Gynaecol 1995;102:638-43. Arias F, Bhide A, Arulkumaran S, Damania K, Daftary S. Arias' Practical Guide to High-Risk Pregnancy and Delivery. Imprint: Elsevier India; 2014. Halloran DR, Cheng YW, Wall TC, Macones GA, Caughey AB. Effect of maternal weight on postterm delivery. J Perinatol 2012;32:85-90. Brace RA, Wolf EJ. Normal amniotic fluid volume changes throughout pregnancy. Am J Obstet Gynecol 1989;161:382-8. Elliott PM, Inman WH. Volume of liquor amnii in normal and abnormal pregnancy. Lancet 1961;2:835-40. Grubb DK, Rabello YA, Paul RH. Post-term pregnancy: Fetal death rate with antepartum surveillance. Obstet Gynecol 1992;79:1024-6. 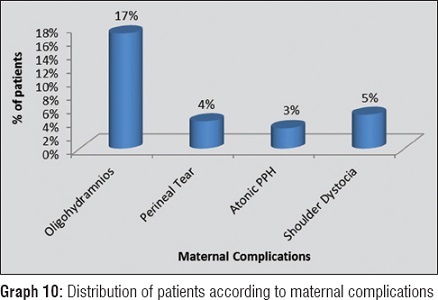 Mahapatro A. Fetomaternal outcome in pregnancy beyond 40 weeks. Int J Pharm Bio Sci 2015;6:53-8. Eden RD, Gergely RZ, Schifrin BS, Wade ME. Comparison of antepartum testing schemes for the management of the postdate pregnancy. Am J Obstet Gynecol 1982;144:683-92. Alexander JM, McIntire DD, Leveno KJ. Forty weeks and beyond: Pregnancy outcomes by week of gestation. Obstet Gynecol 2000;96:291-4. Singhal P. Fetomaternal outcome following postdate pregnancy. A prospective study. J Obstet Gynecol India 2001;51:89-93. Kaplan B, Goldman GA, Peled Y, Hecht-Resnick R, Neri A, Ovadia J. The outcome of post-term pregnancy. A comparative study. J Perinat Med 1995;23:183-9. Kaur D, Saini AS, Kaur J. Maternal and fetal outcome in postdated pregnancies. J Obstet Gynecol India 1997;47:331-4.